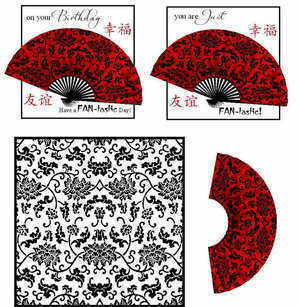 A digi topper kit of a Chinese paper background with a fan. There are two toppers, one with 'On your Birthday, Have a FAN-tastic Day!' 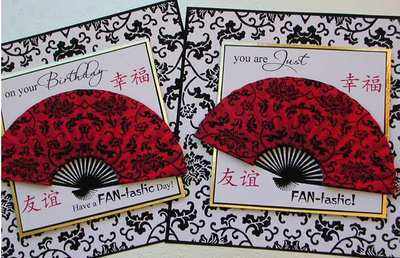 and the other, 'You are Just, FAN-tastic' They both have the Chinese symbols for Happiness and Friendship. The examples have the centre panels mounted onto gold card and raised on foam pads, the fan has two extra layers added.